Just Jingle: It's Your Day! So you should probably play with glitter. Just say'n. It's Your Day! So you should probably play with glitter. Just say'n. Mostly because I love glitter and it is shiny and it is sparkly and it makes me happy. You should play with it because it will make you happy, too. Oh, and it will probably make your dog happy, too, as if you play with it, she will likely be wearing at least some of the wonderful shimmery stuff. Not that I know this from experience or anything. Purely conjecture, here folks, purely conjecture. Just say'n. OH! Before I get on to the glitter don't forget to check out the TWO open giveaways listed above! Awesomeness all around! And I have another one coming hopefully this weekend! Yikes! It's a regular party around here! All I saw was sparkle and fabulousness! I loved the flow of the piece from the top corner the bottom right, as well, so I had to play on that in my design, too! The colors influenced my choice in glitters and I added that simple, final touch of the cabochon flower based on the gorgeous flowers in the inspiration photo. I used Helmar ZapDots to adhere the glitter in perfect little circles. The glitter is Martha Stewart and Pink Paislee. I pulled out my Samantha Walker for Unity Stamp Sweet Life set for the sentiment! I added just a bit of twine from The Twinery to ground it. I don't know about you guys, but I had a SPECTACULAR day yesterday! So, today, It's YOUR DAY!!! Make it a spectacular one! A Stupendous one, even! Pretty much just be awesome and stuff. K? K. Good. Glad we got that settled. Happy Friday, folks! Shine on! So cute!!! LOVE all the sparkle!!! Can you hear me? I am squealing with delight over your card. I love how you interpreted the photo and made your own glitter necklace, complete with cabochon. Awesome!! oh this is just to cute!! love all the glitter!! So cute!! Love the glitter spots & the cute twine treatment. Love this!! Awesome card! Your post reminds me of a school supply commercial....."did I say glitter? Lots and lots of glitter!" This is so pretty! I love the flower thrown in as a terrific foil to all the circles. LOVE your take on the trigger :) So creative and sparkly fun! I end up WEARING my glitter and leaving shiny little trails of it everywhere I go. FUN! I tell people it's not because I'm MESSY but because I'm ... MAGIC! BWAHAHAHAHA! Only setback it when I use GLASS glitter. That stuff can CUT if a finger or bare foot happens upon a stray piece. LOVE your happy card! You are DEFINITELY better at controlling that naughty stuff than I am. I don't know about glitter but your enthusiasm sure makes me happy!! Very nice - love the glitter! very cute!! love the glitter dots although i am not a fan of glitter...you can never get rid of the stuff!! Oh and did I mention I LOVE Glitter! I LOVE this!I had a lovely day yesterday too - in large part thanks to you and your delightful followers. Thanks again for posting such a wonderful review - most of all, I am thrilled that you sincerely loved the book. My heart sings! LOVE the glitter and the card!!! Gorgeous!! Great job! Love the sentiment and I may just have to steal it to make a card for a particular friend. 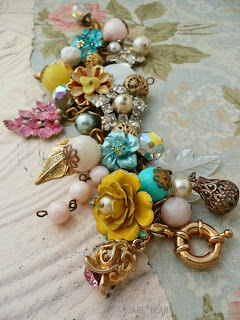 And I totally pinned that jewelry last week because it is totally awesome! Love this glitter! Sure makes me happy! Fantastic card! Who doesn't love glitter, right? Very creative way to use up some stash too! 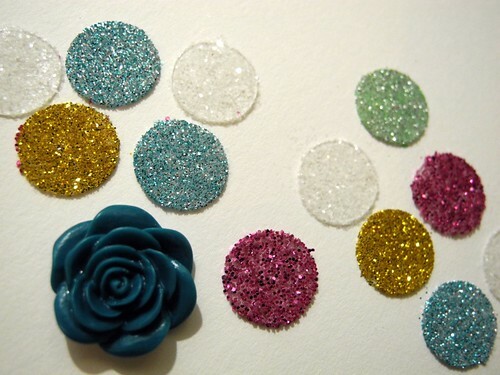 I'm not a huge glitter fan, but adore what you did with this moxie inspiration! Great glittery project. So pretty. just beautiful, love all the gorgeous glittery colors! Love the funky colors and the glitter! Amazing! How beautiful! I love the glitter circles! what a great creative inspiration piece! this would really make me happy. i'm not usually a glitter gal, it seems a little too flashy for me, trying to change that. You would have loved my kitchen nook carpet last night! I started putting in the "glitttery snow" in my display cupboard shelves. You know that fake, stuffing looking, snow you put down for your Christmas village? I had red, green, silver and gold glitter all over my carpet. And for a moment I thought, I should just leave it because it is so pretty... but in the end I swept it up. But the shelves look glittery! Glitter is the gift that keeps on giving! It always brings a smile to my face when I find it days later on myself and my kids. Cute card, love the moxie fab trigger! Love this soooo much! Using the dots was brilliant! This is awsome I love all the glitter and bright colors. Oh Jingle! LOVIN' the glitter!! Great idea and great design! That glitter is as sparkly as you are! What girl doesn't Love glitter! So fun Jingle. Look at all that glittery goodness! What a fun take on the trigger. 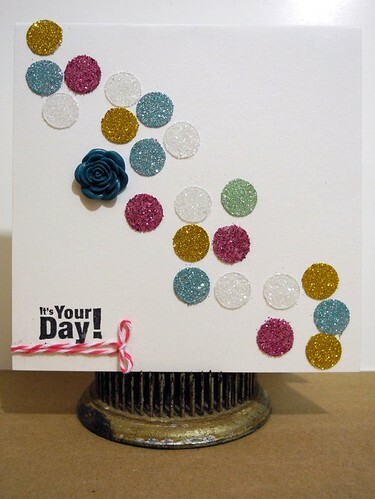 Love all the glitter - I see this working really well on a Christmas card too. SO cute! Even when I don't get out the glitter, it still manages to find its way onto my face . . .
Glitter and I have a love hate relationship. Your card is pretty! LOVE those glitter dots--definitely need to try that technique. Your post is so cheery!! 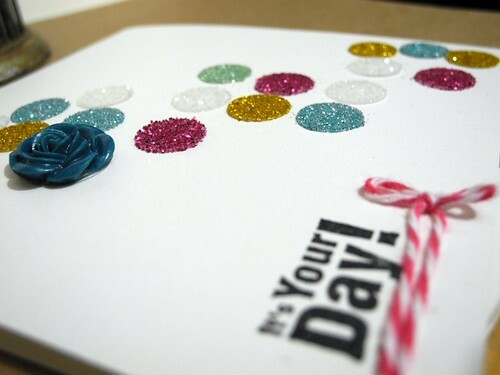 Oh I LOVE glitter, and I love the glittery spots you created on your card!!! Wow! This is fantastic - the white background really makes those colorful dots pop out! This is fabulous! I love it! This is beautiful, Jennifer! I'll have to try out those dots with glitter. Incredible idea to use the glue dot! Brillant! What a cute card! I like glitter too. I haven't yet thought to make my doggy sparkly. I have sparkled myself, my kids, my (unwilling) husband, the table, the floor, and generally everywhere I walk after making a sparkly card. :-) I tell people I'm a princess...I'm not sure they believe me, LOL!